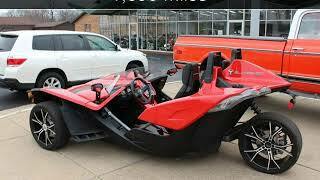 Hi, I am interested in your 2015 Polaris Slingshot (stock #0130C) listed on Autotrader for $17,995. I'd like to get more information about this vehicle and confirm its availability. Freshly Serviced and covered under the MasterCars Care Certified Motorcycle Warranty. Great financing available up to 84 months. WE HAVE VERY AGGRESSIVE FINANCING AVAILABLE FOR ALL TYPES OF CREDIT. Get pre-approved on our secure site at www.mastercarsinc.com as well as view more photos and details. WE ACCEPT TRADE INS OF ALL TYPES...CARS/TRUCKS/SUVS/VANS/MOTORCYCLES/BOATS...especially Corvettes & Harleys. Worldwide shipping available. Stop in and see why we are the St. Louis Area Certified Pre-Owned HARLEY KINGS!!! While youre here, check out our extensive inventory of Corvettes, Luxury & Muscle Cars!! !